Electronics Today International was arguably the most interesting electronics magazine in Australia at one time. Even though it was largely a copy of the style of the English equivalent of the same name. It died off before the end of the 90s and although the original staff tried to resurect it in the form of AEM (Australian electronics monthly) it was short lived. 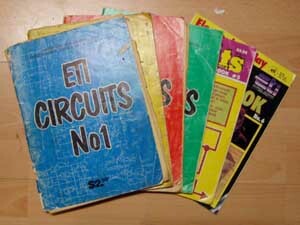 During it's years of publication, dating back to the 60s, ETI occasionally published a series of magazine format books called ETI Circuits. By the mid to late 80s, there were 6 such volumes. The circuits were mainly culled from the reader contributions section. Embellished with whatever sundry bits of circuits cropped up in-house from time to time. These became one of those invaluable resources one hords. Many circuits were useless. Many were absolute gems. Most were interesting and usually unique. SIMPLE DISCO AUTO FADE Uses an LDR stuck straight accross the audio. 3 FUZZ BOXES Several species of small fuzzy animals. TAPE HISS REDUCTION CIRCUIT A 3 transistor emphasis/de-emphasis circuit. TOUCH SWITCHES The usual fare here but may inspire something more fool proof. GUITAR SYNTHESIZER A very simple PLL circuit that may have potential. AUTOWAH WITHOUT TEARS LDR-based Wah Wah circuit. Simple-as. GUITAR WAH-WAH UNIT Based on the now obsolete LM3080 OTA. but a good guide. It is for that reason that I'm putting some of them up here and without permission. (*) I'll take them down if someone complains but they are here because it is in the public interest that they might be preserved. I am preserving them for personal use because my copies are well used and I need to preserve them. If anyone wishes to complain or wishes for me to change/add attribution or anything, please don't hesitate to contact me about them. But I sincerely hope that this is of value and that I'm doing some service here. In the mean time, I'll add to these pages as I have time to do so. (*) NOTE: Since modern magazines no longer exist and no-one seems to be retaining it's old resources, it's a fair bet that no-one cares about this material. It may even be otherwise lost forever. I certainly can't find any existing contacts regarding this material but if one should crop up in the mean time I'm certainly willing to oblige the will of the copyright holders.